These Customized Everyday Products Will Lighten Up Your Day! Fan of everything personalized & pretty? LBB specials showcase the best lifestyle products that are easy to order and will be customized to your preferences. Summer equivalents to travel and it’s about time to travel in style with this customized passport cover. Get your name or your favourite travel quote printed with cute charms on the cover. It has a leather finish to it & comes in various designs and colours. 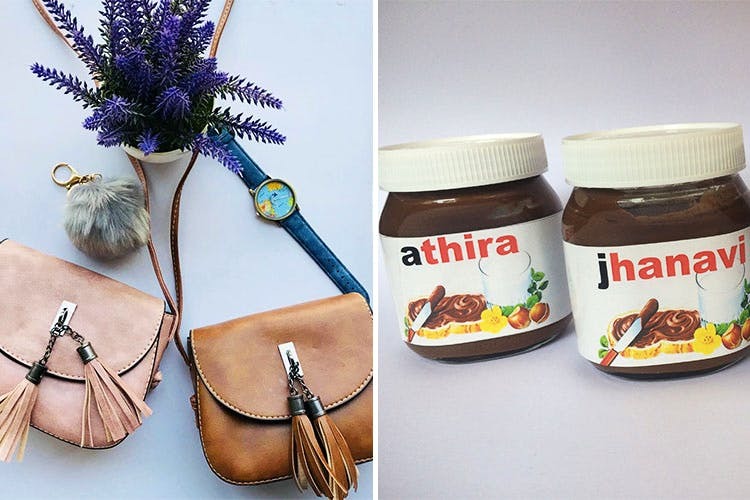 Nutella is life and you can’t miss out on the cute customized Nutella jars that will light up anybody’s day! Add a personal touch to your all-time favourite sweetened hazelnut cocoa spread with your name on the Nutella Jar. This can also double up as a gift! A smart and trendy keychain to ensure you never lose your keys again! The earphone taco is pretty and looks super chic. Both of them come with colour options and can be customized according to your preference. Book lovers and stationery addicts, these handmade customized Dog-ear bookmarks from Eyecandy are too cute to handle. They come in a pair of two and are available in colours like tan & brown. Love everything organised? These customised card holders from Eyecandy are made for you! The cardholder can hold up to 4 cards & slips into a clutch, mini bag or the snug pockets of your skinny jeans! These customised bracelets are amazing gifts for your loved ones! Get their initials imprinted on it and choose from a variety of different colors. To make things even special, getting a matching one for yourself! Personalised things hold a lot more value than the things you pick in the market. Also, if you are the last minute gifter, these are available at a click and you don’t have to stress much!